Little penguins celebrate New Year. 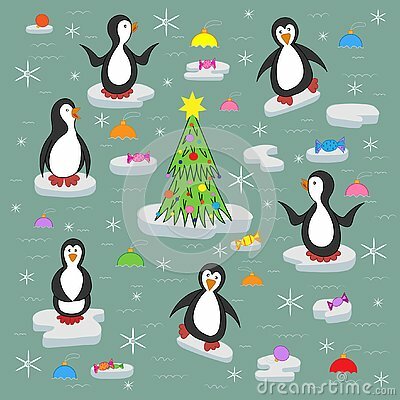 A decorated Christmas tree is floating on a separate ice floe, and there are sweets on small ice floes. Multicolored Christmas balls floating in the water. Penguins on ice floes. Show the poster. Illustration with floating penguins and ice floes. Marine background. Vector Seamless pattern with iceberg, seals, penguins and ice floes.